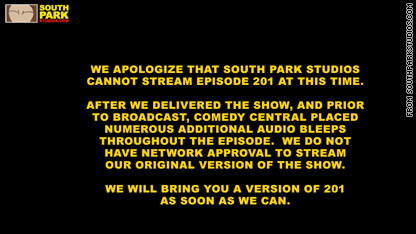 A message on the "South Park" website explaining why the second part of an episode involving Mohammed can't be streamed online yet. What the young man (he prefers to remain anonymous) found disgusting was the depiction of Islam’s revered Prophet Mohammed as a bear mascot in "South Park’s" 200th episode. The depiction was the show authors’ sarcastic attempt to highlight media’s uneasy dealing with the father of Islam as not to offend Muslims who consider any depiction of their prophet as blasphemous. Since his followers insist on him not being shown in any form, producers have always struggled with ways to include Mohammed in story lines without showing him. The most famous of those depictions is the classic Hollywood movie ‘The Message’ by Mustafa al-Akkad about the life of Prophet Mohammed. Being Muslim himself, al-Akkad directed his entire film with extreme sensitivity building the character of the prophet around the wind or the light so it’s a presence that is felt or experienced but not seen. The "South Park" episode showing Mohammed disguised in a bear suit earned the show creators Matt Stone and Trey Parker a jihadist campaign and a serious warning from a radical Islamic group based in New York City. The group posted on its website Revolutionmuslim.com a video filled with reminders of what fundamentalist Muslims did to those who in their eyes “insulted” their prophet. "After we delivered the show, and prior to broadcast, Comedy Central placed numerous additional audio bleeps throughout the episode. We do not have network approval to stream our original version of the show." Comedy Central confirmed they added additional bleeps to the show than what was in the original cut. Whether the decision was an attempt to appeal to Muslims or to keep angry sentiment at bay, nobody knows, but tackling the issue of Mohammed in any way, beeps and censor marks included, still sparks concern among Muslims. El-Houri observed that the "South Park" episode highlighted the fear from “barbaric Muslim retaliation” when a Muslim symbol is featured in the media. He said Muslims should focus on convincing others not to show iconic figure out of “respect to Islam” instead. "Equal opportunity scrutiny, equal opportunity offense," she told CNN's Anderson Cooper. On "South Park’"s Facebook discussion boards, Muslims vented their frustration trying to explain why depicting their prophet is offensive and blamed South Park for fanning the tensions that already exist in the world around this subject. Under the title “Respect my Religion,” posts were mainly defensive. Most tried to expand on their belief that Islam is a religion of peace that respects other religions and prophets. Others blamed the extremists for “hijacking” their religion and using it to justify murdering and threatening people who don’t agree with them. Ahmed Ata Saada said he had seen all "South Park" episodes and he found them “very fun.” But he found it “ridiculous” to make fun of other people’s beliefs and sacred religion. Many other Muslims joined in agreement while non-Muslims comments focused on the right to freedom of speech. Part II of the 200th episode brought more of the same and the reaction does not seem to have picked up anywhere around the Muslim world yet. But the episode did seem to have a clear self-censorship which could have resulted from the warning. The reason for this could be a simple one. In every instance where violence ensued from published or broadcast material that offended Islam, the strong reaction was not immediate or spontaneous. It took time to build steam through video distribution in mosques and on the Internet, supported by clerics and religious leaders’ incitement during sermons and speeches. It is true that hundreds and thousands took to the streets especially following the Danish cartoons controversy. Many of them protested violently burning buildings, cars and calling for the death of the cartoonist. But it is equally true that the majority of Muslims did not take to the streets and expressed their dismay rather peacefully or did not comment at all. While millions around the world watched the violence in the streets of Islamabad, Cairo, and Beirut, there were many other Muslims who appeared on shows to condemn the violence committed in their name and under what they considered it to be the guise of defending Islam. They called for calm and talked about the peaceful nature of Islam instead. Many mainstream Muslim clerics and devout Muslims have said repeatedly that the problem with the Muslim scripture, the Quran, is that it is vast, complex and appears at times to be contradictory. They attribute that to the belief that the verses are based on unique situations that occurred during the life of Prophet Mohammed but don’t apply to modern-day life. It is a known fact that the Quran is open to interpretation; unlike other religions, Muslims don’t have a single entity to make a final call on certain issues. This leaves the door open to local clerics to issue Fatwas or religious edicts, based on their personal belief which could be ultra orthodox, moderate and many shades in between. Blogger Bilal el-Houri has seen both sides first hand in the Middle East. He says no matter how "cruel" the South Park episode is, “it should be a wake up call to Muslims around the world about how they are being portrayed, and instead of grunting and calling for boycotts and other actions, “they should begin by respecting free speech” and they should ask themselves, "why?" Beside the intended humor in "South Park’s" 200th episodes I and II, there seems to be a message about the role of the world’s leading religions with a special emphasis on Islam’s state of affairs. Judging by the many bleeps censoring every time the word Mohammed was uttered and covering the entire “moral” of the episodes if one may call it that. It seems that the creators of South Park are sending the same message as Hirsi Ali and el-Houri; that open dialogue is the way to go. In the midst of "South Park’s" many jokes and jabs, one can conclude that moderate Muslims can take away a message already articulated by many. By enforcing strict rules on depiction of their prophet, they allow the extremists to get all the attention. By doing so, they draw negative attention to their religion, alienate themselves and allow their message to be lost in censorship. In the beginning people with brown shirts would threaten or beat up any one who said anything bad about Adolf Hitler. A well researched, intellegent, balanced artical. Thank you Octavia. However I'm VERY concerned about the posts writen by some of the readers (or perhaps not) of this artical. Balanced moderation and discussion are the ways forward and I hope this is the way the future will lead. I actually have seen this clip brofee, and it is pretty famous back home. This clip has created a lot of ideas and thoughts to a lot of people I know back home about how Muslims are treated in the US. In my opinion, what happened in the clip was absolute racism. During class, we have always been discussing the effects of media on the american population about the middle east and Islam, but at the same time, this clip has played a role in giving people in the middle east a wrong idea as well about the reality here. I believe these things happen around the US to some Muslims, but yet I think it rarely do. Unfortunately, this video has made a lot of people back home in Saudi Arabia generalize their idea about all the americans based on what they saw, and it is completely unacceptable. Speaking of my own experience living in the US from two and a half years, I have not been exposed to such thing since I've been here. All I saw from our fellow American friends were good things. And regarding this specific clip, I think it is really embarrassing to see people as racist as that in the clip. and calling him " a good american"? Rally? What pride does this kind of act bring the american citizens? I think it brings nothing but shame! The fact that a lot of Americans ignore the fact that Muslims form a good percentage of the american population is really ignorance, and we always hear about the political system here in the US and the freedom they always talk about, but unfortunately these rights vanish sometimes when it comes to a Muslim American! Somethings never make sense to me .. Religion is a mask for the ignorant to feel as if they belong to something.